With the collaboration of Addis Ababa University, School of Electrical and Computer Engineering, a seminar has been organized which was presented by Ken Claerbout (K4ZW). In this seminar, an overview of last December’s HF propagation study of the 1.8 MHz and 3.5 MHz presented. Attendees have also gained awareness about aspects of HF radio propagation, the unique challenges of the 1.8 MHz and 3.5 MHz bands, lessons learned, and technology available to improve reliability. For the last couple of months, we have focused more on equipping the new youngsters with the necessary skill and knowledge that would help them to become a better amateur radio operator. Currently, the new youngsters can perfectly operate on SSB and FT8 modes. We have organized a small workshop that emphasized on creating awareness about amateur radio. In this workshop, an overview of the Ethiopian Amateur Radio Society (EARS) presented and the attendees have also visited the society’s only club station, located at Addis Ababa University. ● Haroldas LY5IM has been further working on the High-Altitude Balloon project. 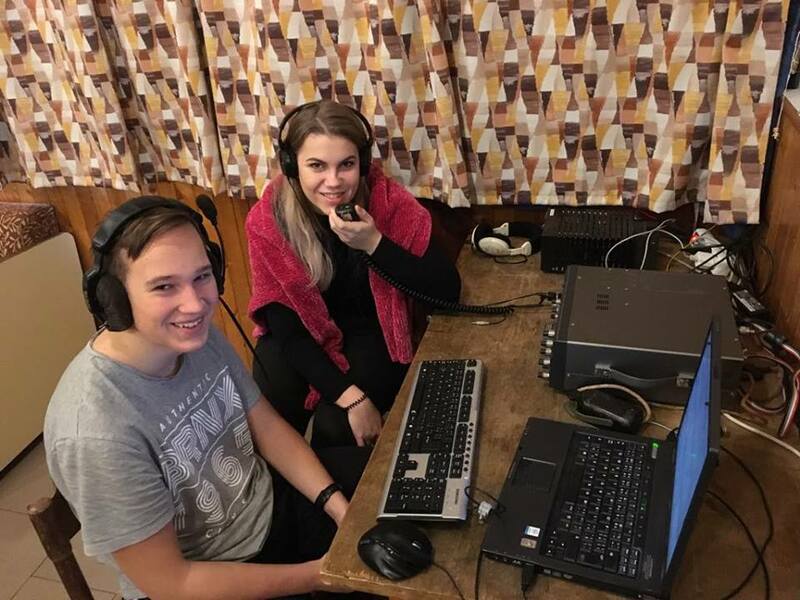 The website is being further developed (​http://www.hab.lt/​) .The balloon project has aired on national television alongside with LY5IM Haroldas, LY3FF Vilius and LY2EN Simonas Kareiva, telling more about the hobby of amateur radio itself . The video can be found at the ending of the report. ● Software and hardware for the baloon are being tested. ● Domantas, LY1JA has been developing Amateur radio manual for beginners. receivers are built to be available for newcomers for the next season. club member – Gedas LY5GK. ● A news article featuring radio sport about Simas LY3EU was published . hobby was presented to a wide public. Special question: When a youngster who has never before heard of amateur radio asks you what it is, how do you explain it in a few short sentences? ● A skill of meeting new people and making your own comm devices by using ham know-how of engineering and physics and still managing to not be dull nerd and have fun. ● It’s all about developing equipment and new techniques to improve communication while having fun experimenting. This allows meeting new people that think alike. It’s omegle for the hipsters! In the past few months, a lot has happened with Train the Trainer in the USA. Our main focus these past few months has been the YOTA month and what we call “CQ Santa.” CQ Santa is where we set up a station at a local hardware store and let kids of all ages talk to Santa over the air. This year, fourteen kids got to talk to Santa and tell him what they wanted for Christmas, along with any questions they had about him or his reindeer. Our plan is to do this in the coming years as well. YOTA month was slower than we expected, but we were able to make over 1000 contacts. Many of these contacts were made by young hams helping kids and kids at heart (a.k.a. adults) get on the air for the first time and experience amateur radio. There is nothing like the feeling a kid gets when they call CQ for the first time and someone answers them from another country, or even just another state. One other thing has contributed to Train the Trainer. Faith Hannah (AE4FH and the author of this report), Hope (KM4IPF), and their dad James (WX4TV) did a four-day DXpedition to the Dry Tortugas (112 km off Key West, Florida in the USA) using the callsign N4T. During this, we were able to educate around five people in person about amateur radio. One of these people was a ham that was camping. He heard us on the air and went scouring the island to find us and ask us what we were doing. Eventually he found us and, after explaining what was going on, we got him on satellite for the first time ever. He was extremely excited to have talked to someone through a 10 cm by 10 cm cube flying through space. Most of the encouraging of youngsters that we did was talking to them on the air. We were able to work around ten kids from all over the USA and Mexico. The girl from Mexico that we worked was excited about talking to another girl. This contact gave me a chance to encourage her to pursue the hobby. Seeing that she was having trouble understanding English over the radio, I talked to her in Spanish when I could to help her out. After all, that could have been her first time on the air. In the future, we plan to continue our YouTube channel Ham Radio (dot) World, where we have been able to inspire people of all ages to get their license. We are also considering a YOTA day, which was described in the last Train the Trainer report. In the next few years we hope to have a YOTA summer camp in the USA. We plan to have events throughout the year where we set up a station and allow anybody to get on the air for the first time. We also plan to spread the word of ham radio by going to hamfests and encouraging people to get active on the bands. Firstly, the YOTA Month 2018 was a bigger success in Macedonia than the one in 2017, since the number of youngsters participating in the event increased by a lot. As opposed to last year, when only a handful of young hams took up the activity, this year many more joined us, even ones who hadn’t been active on the air very much before. Together, on both callsigns, we made around 1000 QSOs. Even though that is relatively few, we still consider it a success and improvement as it was an opportunity to introduce at least ten new young hams to the hobby. We hope that their respective mentors do not wait until next December to activate them again, and instead provide them with the skills required to work QSOs year-round. Specially mentioned are Lina Janeku via her mentor Petrika Janeku Z34PEC, Petar Hristovski who at 10 years old made his first QSO during the activity, and Neda Koceva, mentored by her father Igor Kocev Z33IKN, whose photo of her operating a rig in Gazi Baba Park became viral among the ham community on Twitter and Facebook. Moreover, six people under the age of 14 passed the licence exam and now have their own callsigns. These youngsters also participated in the IARU Kids Day on 5 January this year. It has to be said that the activities during the month of December were predominantly during the weekends, because the youngsters had school obligations as part of the end of the semester, as well as because of the lack of fixed stations in Skopje and Stip, where instead the youngsters worked /P or from the contest location in Sushevo. While so far the majority of young ham activity has been centered in Bitola and Skopje, in the year 2019, the Radioamateur Society of Macedonia will invest more time in activating the other cities and towns of Macedonia where there is potential for activity, as well as an abundance of more experienced hams, who can mentor the youngsters. Recently there has been an interest in setting up stations for remote use, with the reasoning that youngsters can now work QSOs from home during the school days. This solves the issue of some youngsters not having access to a local radio club or station. By no means is it meant to replace regular club activity, as that is a vital part of the hobby, but instead to boost activity by Macedonian youngsters on the air in periods when they are too busy to go to a club. Remote stations were implemented by Z35TUN and Z33RTF in the Radio Club “Stevo Patako” in Bitola and by Z33C in his local radio club in Kavadarci. 73, and we will hopefully report back in two months with more good news. 15 June it’s again Kids Day. This event is especially created to promote Amateur Radio to youth. This is a moment where you can share your amateur radio hobby with your family, grandkids, friends, scouts or even to the general public. This day can be the first time for youth to experience a real radio QSO, hopefully they get interested in becoming a licensed amateur radio operator. This is our first TTT report, here is Fiodor IZ7YBG – someone know me from the 2016 Austrian summer camp, as well as from Friedrichshafen and crazy trips across Europe – taking the task of collecting the wide variety of YOTA activities, which the Italian group does across the country. But, as this is the first Italian report, it’s important to write down “how we get here”, our “little” but amazing history, we are proud of it, as everyone that trust in the YOTA importance, and, more widely in the HAM RADIO is. 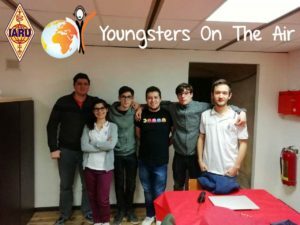 Before 2015, YOTA Italy was just a small group of Italian youngsters, from north, centre and south, taking part to some YOTA summer camps; there wasn’t any kind of organization, bond with the ARI (Italian ham radio society) and growing plan. Between 2014 and 2015, Silvio IZ5DIY and Alex IV3KKW – you will know them for sure – they started to revolutionised the Italian idea of YOTA, being able to “look to the future” in the right way, despite of the bad ARI internal situation, clearly with no time for the YOTA world. Silvio and Alex – with the big help of OMs from Toscana – organized the 2015 YOTA summer camp; strange but true, at that time there weren’t so many youngsters, or to be precise, they weren’t GATHERED. – Participation to the Friedrichshafen exhibition, using to hamcamp as suggested from the Austrian guys (we started to learn from the other country too); At the end of 2016, YOTA Italy counted around 50 members, off course just a 30 % of this big number was active, but, it has been a BIG GOAL, due to an improvement circle that was started from some oldsters like Silvio and Alex, but kept active and increasing tanks to the Italian YOUNGSTERS. – The participation of the Italian team to the Austrian 2016 summer camp had in important effect on our group, we discovered new people in our country as well as outside, made new important and never-ending bonds, placing the foundation for our growth. A big group of guys from the I3 region – Trento, Verona, Venezia, Udine areas – started to gather some years ago. An amazing number of new youngsters – new as well as already licensed – gets involved in ham radio and YOTA. – Team building social and relaxing activities like bowling, pizzas, birthday parties as well as funny trips during winter and summer holidays. Summarizing, the Italian group saw a big growth in the last two years, now, we can count about 70 members on our telegram group. We have a good affluence at our periodic meeting, like ham radio exhibitions, as well as contests and casuals visits to other youngsters due to work or please travels. The interest for the participation to the annual summer camps is growing and we try always to send new people, sure that there will be always other amazing opportunities for the rest of the group to gather with the international part of the YOTA group. However, as whatever group of people/association, we had some troubles in our group too; sometimes we misunderstood – especially due to the use of chats, instead of real life interaction – the actions of each other, reaching the point to argue. But, what is important is that we managed to clear our minds and focus on the next goal, reconciling and, surprisingly, getting new power, as well as new people – both youngster and oldsters like Cristian IN3EYI – involved in our rise to the future. We still have problems with our national society management, they know that we exist, but, maybe, they are too old to give us a real place, a real importance in their “system”. We continue to spread out the verb of YOTA “just” with the helps of local clubs and/or single enthusiast oldsters, but there isn’t a big common national interest for us, at the important level of the association. We rely always on the interest of someone, this is why, maybe, most of the members of the Italian YOTA group are in north Italy – especially around the club of Verona, which is doing a remarkable job – where the common interest for the ham radio and, thus, for the youngsters is higher. This is an another situation that has to be strongly improved: 90% or more of the group is in north Italy. Just for example, I’m quite alone here in I7 Puglia area, 700 km south of the main centre of activity. – Make the centre and south clubs aware of the existence of YOTA, but we still need a big help from the national society management to do that. We are proud to announce that the 9th edition of Youngsters On The Air will be held in Bulgaria, close to the capital city Sofia. BFRA (Bulgarian Federation of Radioamateurs)will be hosting the event, which will take place in the summer of 2019. TTT will not be the only topic of the event, there will be time to enjoy amateur radio as well, think about visiting LZ9W, kit-building or visiting the factory of ACOM. We will be enjoying Bulgaria and get the opportunity to see a part of the beautiful country. Since there are many nationalities visiting the event, there will cultural elements in the event. One of them will be the intercultural evening, where all participants bring foods and drinks from their home country. Previous events have shown that all participants are having an unforgettable week, where many new friendships are started. To obtain a better understanding of such an event you are encouraged to have a look at the gallery and video clips from previous YOTA camps at www.ham-yota.com. Each IARU R1 member society is invited to take part with a team. A team consist of a team leader and team members. We request member societies to select motivated youngsters with an organisational and hands-on mindset. This request requires a commitment from member societies to support these youngsters when they return home after the event. – Age 18-30 years, since we are highly focussing on a train-the-trainer program, it is preferred to select a youth coordinator or person who is eager to organize amateur radio youth events. A person that already attended to a previous YOTA Camp is preferable. – Have not been on a previous YOTA summer camp. If a member society has a valid reason to select a participant who has been to a previous YOTA event, the IARU R1 Youth WG needs to be aware of this and will make the final decision. All participants, including team leaders, should take part in the entire program. All other costs (accommodation, food, activities) are covered. Teams will be picked up at the airport and transported to the venue. Should your member society be interested to participate, please respond by filling in the form (https://goo.gl/forms/EzejaqnTiTAYvht83) before 1 February 2019. Remember, there is a limit of 80 participants. Make sure that you apply in time. We will announce the participating countries, including number of team members, shortly after the deadline date.